The name "Madonna di Ognissanti" means that this huge altarpiece was painted by Giotto for the Church of Ognissanti in Florence. 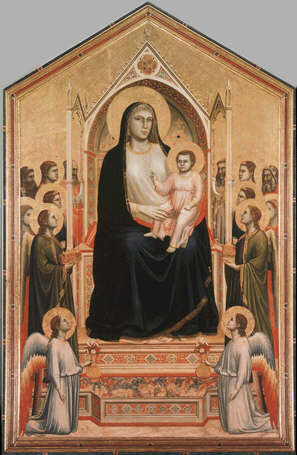 This "Maestà" - "Majesty", which indicates the Virgin Mary sitting on a throne with Jesus on her lap - was painted around 1310 and it is amazing to compare Giotto's Maestà to the other two Majesties by Duccio di Buoninsegna and Cimabue present in this same room of the Uffizi Gallery and painted just a few years before. The comparison of the three Majesties in fact soon reveals how revolutionary was Giotto's use of volume through which he succeeded in painting a religious subject no more cast in a distant and perfect dimension, but moving slowly and respectfully towards a certain kind of realism.